HARD TO BELIEVE that the best Van Halen album ever, Diver Down, was released almost exactly 34 years ago. Click here to read what Eddie and Dave have to say about the album. I'm not a huge Van Halen fan but you can't deny turning it up when one of their songs comes on the radio or iPod or CD player. If you are listening to a CD like I am this morning at Second String Music, well, more power to you. Whether it was with Sammy or with Dave, Van Halen rocked. I have no preference either way. They were a beer-swilling party rock anthem band, and they didn't care what people thought. I remember watching "Jump" for the first time at a friend's house and thinking, "Wow, love the keyboards - these guys have it figured out." I believe it was 1984 and the video was on MTV. Gosh, do I feel old. There is a lot of debate about Van Halen's best album. You could argue the first record (yeah, record, the shiny round black things) is the best debut album by a band. But I like Diver Down - it has a flow and a synergy to it. Eddie Van Halen is the baddest guitar player around, but his playing on this album is more melodic and subdued - great guitar players know what to play when, and when not to play. What can you say about a band with a guitar player and drummer who call their dad so he can play dixieland clarinet on a rock album? And Happy Trails just kills me. Throw in Cathedral, Little Guitars, two killer cover songs and Little Guitars, and you have a masterpiece. 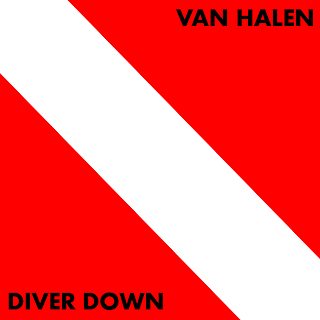 Some die-hard Van Halen fans claim Diver Down was hastily recorded (12 days) and complain about the production. What? Do you know who is in this band, and what they do? To me it sounds like spent 12 days hanging out and cranking out great music. You can tell when something is overproduced, and much of today's music is waaaaayyyy overproduced. I don't know if anybody listens to an entire album anymore. I think you appreciate it more when the whole thing gets played. I think we've lost the art of listening and appreciation. Now days we just buy a single song off iTunes or cue it up on YouTube. Sheryl just bought Foreigner 4 and The Grand Illusion by Styx and I'm tempted to pop them in the CD player today. But I gotta cue up Diver Down one more time.